This information will help to answer some of the most common enquiries about higher degree research. We encourage you to review these FAQs and if you have any further questions please contact the Graduate Research School. What is the Doctor of Philosophy (PhD)? The Doctor of Philosophy (PhD) degree provides training and supervision to build your capacity to conduct independent research at a high level of originality and quality. As a PhD candidate, you will uncover new knowledge though the discovery of new facts, the formulation of theories or the innovative interpretation of known data and established ideas. In the Doctor of Philosophy, you will undertake a supervised research project and develop a written thesis in your chosen discipline. Visit the Doctor of Philosophy course page for more information. What is the Doctor of Creative Arts (DCA)? The Doctor of Creative Arts (DCA) provides professional artists with recognition of both their practice and the contribution they make to professional and scholarly knowledge. In the Doctor of Creative Arts, you are required to undertake the development of a body of original creative work within your chosen discipline. This must be supported by a written exegesis explaining the contextual and theoretical underpinning of the creative work. Visit the Doctor of Creative Arts course page for more information. What is the Doctor of Cultural Research (DCR)? The Doctor of Cultural Research (DCR) is designed to produce future professional leaders in a range of industry settings where culture is an important dimension of the typical issues and problems faced in that workplace or organisation. In the Doctor of Cultural Research, you are required to produce an examinable portfolio of work that provides evidence of significant conceptual development and professional capacity relevant to the better understanding of significant problems in practice. You will also be expected to actively participate in seminars, conference presentations, workshops and other research training and development activities. Visit the Doctor of Cultural Research course page for more information. What is the Doctor of Education (EdD)? The Doctor of Education (EdD) is a degree in practice-led research and research-led practice and aims to produce graduates capable of conducting independent research at the highest level of quality and originality. Candidates are required to produce an examinable portfolio of work that will normally be text based, but will allow the inclusion of other communication mediums such as video or internet resources. You will also be expected to actively participate in seminars, conference presentations, workshops and other research training and development activities. Visit the Doctor of Education course page for more information. What are the minimum requirements for admission to a doctorate degree? To approve your application into a doctorate degree, Western Sydney University must be satisfied that you are able to commence independent study at an appropriate level. The preferred pathway into a doctorate at Western Sydney University is through the Master of Research. Qualifications from a university or other tertiary institution deemed to be equivalent to the requirements as set out above. Approval of prior experience or qualifications for all higher research degrees is at the discretion of the School Dean or Institute Director. How do I apply for a doctorate degree? Applications for doctorate degrees are made to the Graduate Research School via the Online Application Portal. (opens in a new window) Applications are accepted all year round and there is no cost to apply. To apply for a doctorate degree, you will need to ensure that you meet the minimum entry requirements for admission at Western Sydney University. You will also need to contact a suitable supervisor(s) in your area of interest, prepare documentation to support your application and write a research proposal. For more information, visit the how to apply for research degrees page. Do I need to find a potential supervisor before I apply for a doctorate degree? Ideally, you should identify one or more potential supervisors before submitting an application. This will help to streamline the application process as your School or Institute must confirm that they are able to provide suitable supervision before you will be offered admission. You can search for potential supervisors via the staff profiles(opens in a new window) or talk to the relevant School or Institute HDR Director. Are scholarships available for doctorate degrees? Yes, scholarship releases and project scholarships are offered throughout the year. Visit the scholarships page for more information about how to apply. What is the minimum length of a doctoral candidature? The minimum length of a doctoral candidature is 3 years full-time (or part-time equivalent). It is possible to apply for early submission for examination. You should talk to your School or Institute HDR Director if you are interested in early submission. What is the maximum length of a doctoral candidature? The maximum length of a doctoral candidature is 4 years full-time (or part-time equivalent). Extensions are only considered in exceptional circumstances. It is the responsibility of you and your supervisory panel to ensure that you are able to submit for examination on time. What is the Master of Research (MRes)? The Master of Research is a research training degree that provides you with a pathway to PhD study and a research career. In the first year, you will undertake an intensive research training coursework program and engage with peers and academics in an interdisciplinary environment. The first year will help you to build your skills as a researcher, master the art of knowledge translation and develop a strong research proposal. In the second year, you will take on a research project under the supervision of a specialist in your field – culminating in the production of a 25,000 word research thesis. Visit the Master of Research course page or the frequently asked questions for more information. What is the Master of Philosophy (MPhil)? The Master of Philosophy is a supervised program of original research and provides an opportunity to develop and enhance analytical and research skills through independent investigation in a specific field. The Master of Philosophy is completed within 1-2 years full-time candidature. Visit the Master of Philosophy course page for more information. What are the English language requirements for international students applying for a research degree? If you have completed your undergraduate or postgraduate study overseas, you will need to provide evidence that the language of instruction was in English or provide English language test results (IELTS or TOEFL). Visit the International entry requirements page for more information. Can I study a research degree online or by distance? In most cases, it is preferable that you are available on campus to work closely with your supervisory panel and attend seminars and other events. If you are considering undertaking a research degree by distance, please contact the School or Institute HDR Director to find out if this will be feasible option for your proposed research project. Do domestic candidates pay fees to study a research degree? Domestic higher degree research candidates are provided with a funded place in the degree under the Australian Government Research Training Program (RTP)(opens in a new window). The Doctor of Philosophy (PhD) and professional doctorates are funded for a maximum period of 4 years full-time, or part-time equivalent. The Master of Philosophy is funded for a maximum period of 2 years full-time, or part-time equivalent. There is no stipend attached to a Research Training Program place, however, all research candidates are provided with the resources they need to support their project. It is Australian Government policy that applicants who have partly completed a research degree, at Western Sydney University or elsewhere, may have the previous period of their candidature deducted from the maximum time allowed. Do international candidates pay fees to study a research degree? International higher degree research fees vary depending on the area of study. Refer to our International Research Fee Schedule(opens in a new window) for more information. International students are required to have genuine access to sufficient funds while studying in Australia. Funds should be sufficient to contribute to the cost of tuition, travel, living costs and school costs of any dependants. What is the Student Services and Amenities Fee (SSAF)? The Student Services and Amenities Fee (SSAF)(opens in a new window) is used to fund essential campus services and facilities, and enables Western Sydney University to retain funding for teaching and research. SSAF applies to all campus-based domestic and international students and is payable twice-annually. Are there orientation sessions for new HDR candidates? Yes, the Graduate Research School hosts regular orientation sessions for new HDR candidates. Orientation is a great way to meet your fellow researchers and find out more about life as a research student. Information about upcoming orientation sessions and invitations to attend will be sent directly to your student email account. You are also encouraged to read the HDR Candidate Handbook (PDF, 682.28 KB)(opens in a new window) which contains important information about your candidature. How do I check my student record? You can view and manage your student record by visiting MyStudentRecords (MySR)(opens in a new window) and using your student ID and password to log in to the system. Visit the MyStudentRecords page for more information. Your official student email address is your student identification number followed by @student.westernsydney.edu.au (for example 12345678@student.westernsydney.edu.au). Visit the student email page for more information. Where can I collect my student identification card? Once you are enrolled, you can collect your student identification (ID) card from any Student Central office. You will need your student ID card to access the library and use computer labs. You may also need it to access buildings and for other campus security matters. Visit the student ID page for more information. What training and workshops are available on campus? The Graduate Research School offers a range of on-campus workshops open to all higher degree research candidates. The workshops are targeted to meet your needs at the various stages of your candidature. Please visit the HDR Workshops calendar for more information and the current schedule. Are there any online training modules or workshops? Yes, the 'Research Training' vUWS site is available to all research candidates and provides access to a range of online programs, tools and resources. The site features videos, articles, handouts, suggested readings and other information to help you develop your research writing and presentation skills and supports the on-campus workshops program. You can access the site via vUWS(opens in a new window) using your student ID and password. Is there any compulsory training I need to complete? Yes, you need to complete the online modules 'Research Fundamentals' and 'Responsible Conduct of Research' within the first three months of your candidature. You must provide evidence of completion of these modules at your Confirmation of Candidature. Can I use Turnitin to check my thesis for plagiarism and referencing? Yes, you can access a Turnitin submission link set up specifically for research candidates via the 'Research Training' vUWS site. 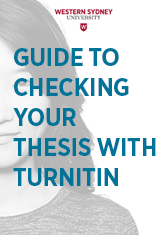 (opens in a new window) It is recommend that all candidates submit their thesis through Turnitin to check for plagiarism and missing references and that you discuss the results of the report with your supervisory panel. Why can't I see the Research Training site when I log in to vUWS? Are you logging in to vUWS using your student ID and password? Is there an encumbrance on your account due to outstanding fees (such as SSAF)? If you need further advice about accessing the Research Training site, please contact the Graduate Research School at grs.hdr@westernsydney.edu.au. What is an Early Candidature Plan? An Early Candidature Plan (ECP) establishes your goals and objectives and provides a framework for evaluating your progress from the early stages of your research project and sets you on the correct pathway through to the submission of your thesis. Your Early Candidature Plan identifies training and development that you will need to undertake during your candidature in order to successfully complete your project. When do I need to complete an Early Candidature Plan? You must submit your approved Early Candidature Plan within two months (60 calendar days) of your research commencement date. This applies to both full-time and part-time candidates. How do I complete my Early Candidature Plan? Step 2. Meet with your principal supervisor to discuss your current progress and the Early Candidature Plan. Fill out any sections of the form that you can in advance of your meeting. Step 3. Submit the approved form to the Graduate Research School. Is it compulsory to complete an Early Candidature Plan? Yes, you must submit your approved Early Candidature Plan within two months (60 calendar days) of your research commencement date. You will not be able to complete your Confirmation of Candidature if you have not completed an Early Candidature Plan. Will I be locked in to what I have outlined in my Early Candidature Plan? No, the Early Candidature Plan is flexible and you should expect to revise it as your candidature progresses. Your plan may form the basis of further goal setting throughout your candidature and it may be useful to revisit it with your supervisors as you approach milestones such as your Confirmation of Candidature and Annual Progress Reports. What is the Confirmation of Candidature? The Confirmation of Candidature (also known as the CoC) is a significant milestone in the first year of your research. It is a formal and comprehensive process that reviews the current progress of your candidature and your plan for completion. As part of the CoC, you will receive feedback about your research project and it is an opportunity to identify areas for improvement and further development. What happens at the Confirmation of Candidature? The Confirmation of Candidature is a compulsory requirement for all first year research candidates. It is usually completed within the first six months of your candidature, and must be completed within your first year of candidature. At the Confirmation of Candidature, you are required to submit a written document between 3,000 and 10,000 words. You will also be required to give a presentation to an expert academic committee and respond to questions from the panel. Based on the feedback you receive at your CoC, you may be required to make changes to your CoC document and provide further details about your plan for completion. What is the purpose of the Confirmation of Candidature? The Confirmation of Candidature is designed to help you and your School or Institute to identify any issues that may impact the timely and satisfactory completion of your research project and the writing up of your thesis. The milestone is set to be completed within the first year so that you have time to take the necessary steps to adjust your research project or undertake development and still complete within the maximum candidature timeframe of your degree. While the Confirmation of Candidature may feel like you are being assessed, you should keep in mind that a research degree is a joint venture between you, your supervisors and your School or Institute. You are working towards a common goal and everyone involved wants to see you succeed in your study. Why is the Confirmation of Candidature important? The Confirmation of Candidature is important for a wide range of reasons and is a crucial milestone in your research degree. the ability of the School or Institute to adequately supervise and resource your project. While it can be confronting to present your project at the Confirmation of Candidature, many candidates find the process to be affirming and even enjoyable. It can help you to feel more confident about your project and your ability to complete the degree. Completing the Confirmation of Candidature is an achievement and an important milestone in your study. Your project will now be focussed and defined, and you will have a clear plan for the work that needs to be done to complete your thesis. What are the requirements for the Confirmation of Candidature? you must present a clear schedule demonstrating how you will complete within the remaining timeframe. You may be required to formally respond to feedback following your Confirmation of Candidature and submit changes to your written document. You cannot enrol in the second year of your degree or submit your ethics application until your Confirmation of Candidature has been successfully completed. What happens at the Confirmation of Candidature presentation? At the Confirmation of Candidature presentation, you will verbally present your research project and your current progress. Generally, this will follow a similar format to your written document and should demonstrate that you are confident in talking in detail about your research project. The Confirmation of Candidature will be chaired by your School or Institute HDR Director, or equivalent, and will take around one hour. The format is at the discretion of the Chair, but in most cases the candidate will present for 15 minutes and this is followed by a questions and answer session. The committee will begin by asking you questions, but you are also encouraged to ask questions to the committee. Confirmation of Candidature presentations may be held in an open forum and people outside the academic committee may be invited to attend. For example, some Confirmation of Candidatures are undertaken as part of other activities such as School and Institute conferences. In these cases, the audience does not contribute to the assessment of the candidature and feedback should be provided to the candidate in private. You should see an open Confirmation of Candidature as an opportunity to present your work to the wider research community and the experience may generate interest in your project beyond your supervisory panel. Who forms the Confirmation of Candidature advisory committee? The Confirmation of Candidature advisory committee is not the same as your supervisory panel. It should always include your Higher Degree Research Director or equivalent, and additional expertise either from within your School or Institute or through other relevant Western Sydney University collaborators. External expertise may also be included in the advisory committee. What are my responsibilities as a candidate? You must submit a final, paginated manuscript to your principal supervisor for review and approval at least one week prior to the Confirmation of Candidature. This will allow the advisory committee sufficient time to consider the material, prepare questions and understand your research project. You should talk to your principal supervisor or HDR Director about the expected date for your Confirmation of Candidature early to ensure that you have sufficient time to prepare the document, your presentation and meet any other requirements. What are the responsibilities of my principal supervisor? administrative follow up after the Confirmation of Candidature which includes ensuring the candidate and the advisory committee are given copies of the report. What feedback will I receive at the Confirmation of Candidature? You will be provided with preliminary feedback following your presentation at the Confirmation of Candidature. The advisory committee will then prepare a final report. A – The candidature is confirmed. B - The candidature is confirmed subject to minor amendments/rewriting identified by the advisory committee. These amendments are to be undertaken to the satisfaction of the principal supervisor and the HDR Director. C - The candidature to be confirmed subject to major amendments/rewriting identified by the advisory committee. The amendments will be circulated electronically to the advisory committee (a second presentation is not required). D - The candidature is not confirmed on the basis of the submitted written document and the candidate is required to resubmit a new proposal with a second presentation required. E - The candidature is not confirmed and it is recommended that the School or Institute Research and Higher Degrees Committee consider downgrading the degree, if applicable. 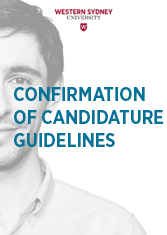 F - The candidature be reviewed by the School or Institute Research and Higher Degrees Committee to consider recommending that the candidate is invited to show cause why the candidature should not be terminated. A copy of the report will be provided to you and will also be lodged with the Graduate Research School. In addition to the outcome of your report, you may also be recommended to seek assistance with writing, research, presentation and analytic skills. What are Candidature Support Funds? Western Sydney University Schools and Institutes are required to provide HDR candidates with access to funding to support their research under the Research Higher Degree Candidature Essential Resources Policy. (opens in a new window) The funds are available to assist you in meeting the incidental costs of your research project. How much can I claim as Candidature Support Funds? HDR candidates in humanities, social sciences, business and law disciplines may claim up to $2,000 per candidate, per full-time year enrolled at Western Sydney University. HDR candidates in consumable-intensive science disciplines may claim up to $7,000 per candidate, per full-time year enrolled at Western Sydney University. You may apply for funds up to the limits described above, however, your request is subject to approval by your School or Institute. Your School or Institute may apply the funds on a pro rata basis as per the requirements of your candidature. What can I claim under Candidature Support Funds? When should I apply for Candidature Support Funds? You can submit an application for Candidature Support Funds at any time during your candidature. You should discuss the requirements of your project with your supervisory panel early in your candidature to establish what resources you will need and if these can be covered by under your Candidature Support Funds. At the very latest, this should be completed prior to your Confirmation of Candidature. You must maintain clear records when claiming Candidature Support Funds, including original receipts, invoices, travel approvals and other supporting documentation. You must ensure that your Candidature Support Funds application is approved prior to entering into any agreements with external providers. How do I apply for Candidature Support Funds? Your School or Institute may require other evidence or supporting documentation. Please contact your HDR Director for more information. Am I guaranteed to receive my full claim for Candidature Support Funds? No. Candidature Support Funds are not a direct payment to you on the basis of your enrolment. You application and any supporting documentation will be carefully assessed by your School or Institute and funding will be distributed based on resource availability and the essential requirements of your candidature. Do I personally own acquisitions made with Candidature Support Funds? No. Purchases and acquisitions made using Candidature Support Funds remain the property of Western Sydney University and must be returned to your School or Institute at the completion of your study or at your withdrawal from your candidature. If I make changes to my candidature, will I be eligible for additional Candidature Support Funds? No. Any changes to the direction of your work or the focus of your project will not automatically make you eligible for additional resources. You will need to apply to your School or Institute if your require additional funding. Who can I talk to about ethics relating to my research project? The Ethics and Integrity Team can help you with all ethics matters relating to your research project. This includes human ethics, animal ethics, biosafety and radiation safety, academic integrity matters and ethics applications. What is a Human Research Ethics Application (HREA)? The Human Research Ethics Application (HREA)(opens in a new window) is a concise online application system to facilitate the efficient and effect ethics review for research involving humans. If you need assistance with completing the HREA, please contact the Ethics and Integrity Team. Annual Progress Reports provide information directly to your School or Institute about your candidature progress, including your achievements, your plan for completion and any challenges that may impact your project. Is the Annual Progress Report compulsory? Yes, all continuing candidates must complete an Annual Progress Report. Failure to complete your report may jeopardise your enrolment and you may be asked to show cause as to why your candidature should be allowed to continue. The Graduate Research School will contact you via your student email with advice about how and when to complete your Annual Progress Report. When do I have to complete an Annual Progress Report? You must complete an Annual Progress Report once every year after you have completed your Confirmation of Candidature. The Graduate Research School will contact you via your student email with advice about how and when to complete your Annual Progress Report. How do complete my Annual Progress Report? The Graduate Research School will contact you via your student email with advice about how to complete your Annual Progress Report. What is included in an Annual Progress Report? Annual Progress Reports include both a candidate report and a supervisory panel report. These reports contain a summary of the work undertaken in the previous 12 months, or since your commencement date. They will also contain a timeline and your plans for completion, comments on your progress in relation to your expected completion date and comments from your supervisory panel. What happens if my candidature is not progressing as expected? If your Annual Progress Report indicates that your candidature is not progressing as well as expected or if your progress is considered unsatisfactory, your School or Institute may recommend specific actions to correct the situation. These actions will need to be performed within set timeframes and are subject to further review. In serious circumstances, your School or Institute may initiate a show cause process as a result of the Annual Progress Report. Can I submit confidential feedback in an Annual Progress Report? Yes, you have the option to submit your Annual Progress Report directly to the Graduate Research School. You may consider this option if there is an issue between you and your supervisory panel that you would like dealt with confidentially. The Graduate Research School can act as an independent liaison between a candidate and their School or Institute. Are Annual Progress Reports considered if I apply for a candidature variation? Yes, Annual Progress Reports will be considered if you apply for a candidature variation such as a leave of absence or an extension. It is important to provide details of any potential delays to your candidature when completing your Annual Progress Report for future reference. Should I use the Annual Progress Report to raise concerns about my candidature? Yes, the Annual Progress Report can be used to raise concerns about your candidature, however, it should not be first point at which your supervisors and your School or Institute are made aware of a problem. It is not uncommon for candidates to experience challenges in their personal life or their research project. There are resources and assistance available to support you. When issues arise, it is expected that both candidates and supervisors will take active steps to rectify the situation with the support of their School or Institute HDR Director and the Graduate Research School. Can I travel overseas as part of my research? Your research may require you to travel and carry out fieldwork and research overseas. This can be an exciting opportunity, however, it is important that you understand the risks involved and meet all the requirements before you can travel. When do the Western Sydney University travel rules apply for overseas research? As a candidate, you are considered a Western Sydney University traveller if you are conducting work overseas that contributes towards your degree, irrespective of whether you are funded by Western Sydney University or otherwise. Are there visa implications for international candidates travelling overseas? International candidates must contact Western Sydney University International for advice about the validity of your visa if you plan to leave Australia for any period. Can scholarship holders take leave for overseas field research? You make take up to 12 months field work overseas and continue to receive your scholarship. You must meet certain conditions in relation to supervision during the period and the work must be relevant to the completion of your degree. How do I apply for permission to travel overseas? If you are planning to travel overseas to conduct research, you must apply using the Application to Vary Research Candidature/Scholarship Form (PDF, 120.58 KB). (opens in a new window) You must apply for permission to travel to your School or Institute HDR Director (or equivalent) at least three months before the proposed date of departure. How do I organise my overseas travel for field research? All overseas travel arrangements are processed via the Travel and Expense Management System (TEMS). Applications must be lodged via the system at least 21 days prior to departure. Refer to the Travel Policy(opens in a new window) for further guidelines. What happens if there are travel restrictions covering my overseas destination? All travel approvals are considered on a case by case basis. Travel to destinations where the DFAT travel advisory classification is "reconsider your need to travel" must be approved by the relevant Executive Dean or Deputy Vice-Chancellor. If travel has been booked and the DFAT travel advisory classification escalates to "reconsider your need to travel", the Executive Dean or Deputy Vice-Chancellor must again approve travel before departure. Western Sydney University will not approve travel where the DFAT travel advisory classification is "do not travel". In cases where the classification escalates to "do not travel" the travel approval is withdrawn. If the DFAT travel advisory classification escalates after travel has commenced, the relevant School or Institute should make contact with the traveller and assist in their return if warranted. The Finance Officer should be notified for travel and insurance assistance. Western Sydney University travellers approved to travel to destinations where a "reconsider your need to travel" classification has been issued must register with Smartraveller (DFAT)(opens in a new window) prior to departure. Irrespective of travel warnings, all travellers are encouraged to register their overseas travel plans with DFAT prior to departure. Can I use the services of a professional editor when preparing my thesis for examination? Yes, you may use the services of a professional editor in preparing your thesis for examination. You must discuss this with your principal supervisor to ensure you have a clear understanding of the acceptable level of editing and how to evaluate editorial suggestions and recommendations. How much professional editing is allowed when preparing my thesis for examination? Professional editing is not a shortcut in preparing your thesis for examination. It should be used for the purposes of detecting minor typographical, formatting or stylistic errors in your thesis. A professional editor does no correct systemic misunderstandings of grammar or language throughout your thesis and there is no guarantee the editor will identify all errors. You are responsible for the final content, presentation and integrity of your thesis. What should I do if I think my thesis requires substantial editing prior to examination? You should not use a professional editor to correct significant mistakes in your writing. If you need assistance with writing skills development and/or English proficiency, you need to raise this with your supervisors early in your candidature and proactively access the academic writing support available to you via your School or Institute and the Graduate Research School. Where can I find a professional editor for my thesis? Western Sydney University does not provide professional editing support for higher degree research candidates. The Institute of Professional Editors (IPEd)(opens in a new window) is the national professional association for Australian editors. It provides information about editing research theses and maintains a directory of professional editors. What supporting information do I need to provide to a professional editor when preparing my thesis for examination? If you wish to use the services of a professional editor, you must read the document Editing of Research Theses by Professional Editors (PDF, 97.72 KB). (opens in a new window) The guidelines outline the extent and nature of editorial services that professional editors can provide when editing research theses. These guidelines were developed by the Deans and Directors of Graduate Studies collaboratively with the Institute of Professional Editors (IPEd) and has been endorsed by Western Sydney University. Do I need to acknowledge my thesis has been edited by a professional editor? Yes, when a thesis has had the benefit of professional editorial advice, of any form, the name of the editor and a brief description of the service rendered, in terms of Australian Standards for Editing Practice,(opens in a new window) should be printed as part of the thesis list of acknowledgements or other prefatory matter. If the professional editor's current or former area of academic specialisation is similar to that of the candidate, this should be stated in the prefatory matter of the thesis. What are the guidelines for preparing my thesis for examination? 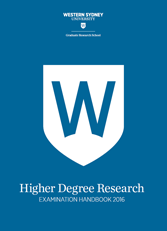 The Higher Degree Research Examination Handbook (PDF, 668.49 KB)(opens in a new window) provides information about preparing your thesis for submission and the thesis examination process. The handbook explains the steps in the thesis examination process, including finalising your document, the expected timeline and who is responsible for various tasks. The following video series also provides some helpful tips and advice for the final stages of your candidature. How do I submit my thesis for examination? Your thesis should be submitted electronically to the Graduate Research School as per the following instructions. You do not need to provide a hardcopy of your thesis unless specifically requested by the Graduate Research School. You must also submit an approved copy of the following form. If you do not follow the submission instructions and/or do not include an approved thesis submission form, your examination may be delayed. Who can I contact for help with using CloudStor? Do I need to submit a hardcopy of my thesis? No, you should submit your thesis electronically to the Graduate Research School. If your examiners request a hardcopy of your thesis, the Graduate Research School will advise you about the submission process. How long does the thesis examination process take? The thesis examination process is lengthy and it can take 4-6 months for you to receive an outcome. The Graduate Research School is not able to provide you with updates during the examination process and will contact you if we require further information.